A third tier of the story also concerns the passing of the time, the film opens with Coldplay’s “Yellow” (remember when their were this small up-and-coming indie band? ), reminds us of the excitement of Obama’s election campaign, and Lady Gaga’s video for “Telephone”. Viewers will of course remind themselves of where they were and what they were doing at these times, alongside identifying with the issues of childhood and adolescence Mason encounters. The genius of the film is the way in which in captures Mason’s concerns that are unique to his age. Early scenes include his sister doing his best to wind him up by singing Britney Spear’s, which results in him predictably getting the blame when they start hitting each other. Later on as teenagers Mason, Samantha and Mason’s father must suffer through the mutual awkwardness of having a talk about the importance contraception and consent. The film also benefits from choosing not to have a main story that the characters follow, despite having many moments of growth and achievement for all the main characters. There is the sense that the events that do happen are merely the result of growing older, rather than the characters following some set script or meticulous plotting. This makes the characters feel a lot more real and relatable, and it’s sad to bid them all adieu at the end of the film’s almost 3-hour runtime. 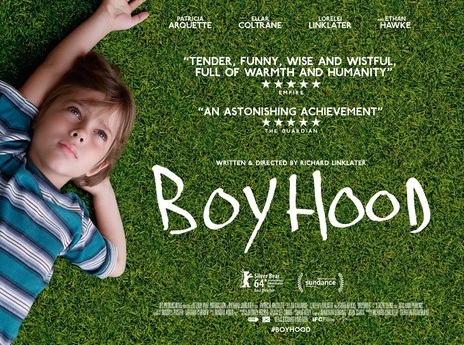 Boyhood is one of those rare films that makes movie-making seem so easy yet so creative. In capturing the passing of time it becomes a film you somehow take ownership over as you remember similar situations and problems you had to encounter as you grew older; like watching old home videos of yourself as they suddenly jump between successive Christmases or summer holidays. The passing of time is a strange, terrifying and wonderful thing, it’s difficult to think of another film that captures it so well. This entry was posted in Boyhood, movie, watching and tagged fillm. Bookmark the permalink.